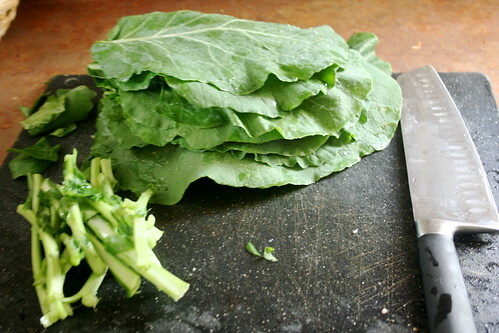 I didn’t grow up eating collard greens. My parents hail from Michigan and, even though I lived in the South, it’s easy to avoid Southern food in Atlanta. 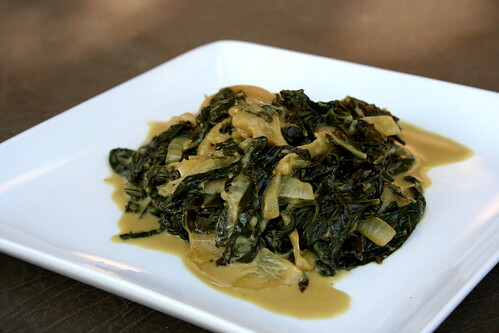 When I decided to go vegan, however, the world of Southern cuisine became more and more appetizing–minus the excess fat, dishes like collard greens seemed accessible and delicious. 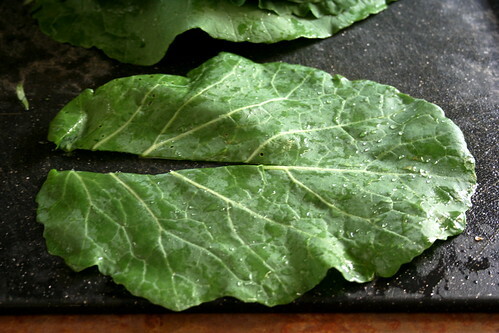 In southwest Virginia, collards are in-season in November, a fact that makes them an excellent choice for Thanksgiving. The fresher, the better in my opinion. 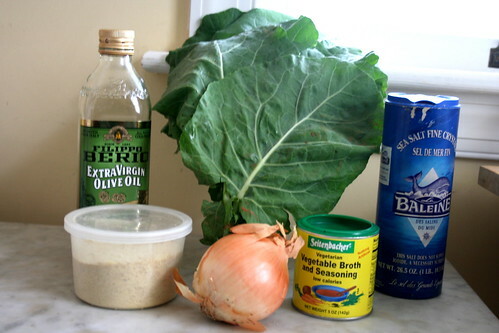 This recipe calls for almost all “normal” pantry items, minus the nutritional yeast which can be found cheaply in the bulk section of your natural foods co-op (Roanoke Natural Foods Co-op here in Roanoke), and the greens take their layered sweet and nutty flavor from the combination of caramelized onions and the nutritional yeast. For the vegetable broth, I use vegetable broth powder mixed in water, but you can also use a bouillon cube or canned or boxed broth–just make sure it’s vegetable and not chicken! Cut the onion in half and chop off the ends. Remove the outer paper layer. 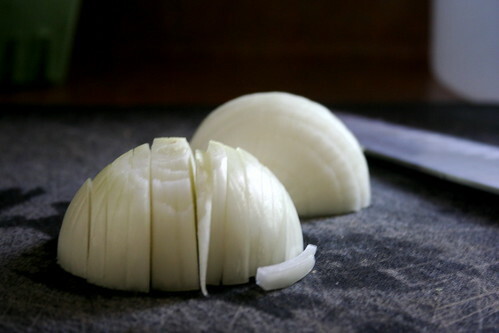 Take each half of the onion and cut lengthwise into small, even strips. In the pot, heat the olive oil over low (as low as it can go while still being on) on the stove. 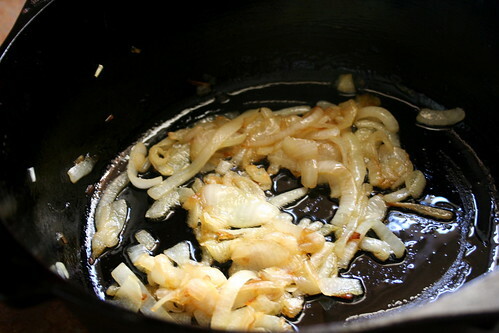 Add the onions, stir to cover with the oil, and let the onions cook for approximately 45 minutes in order to caramelize them. Stir the onions every 3-5 minutes or so to keep the onions from burning. You want them cook an even, light brown, caramel color. Meanwhile, rinse the greens to remove any dirt. 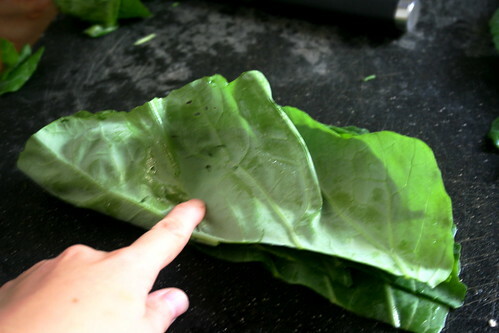 Derib the leaves by cutting out the remaining stem inside the leaf. You’ll have a little “v” shape on each leaf. Stack five or six leaves and fold over. 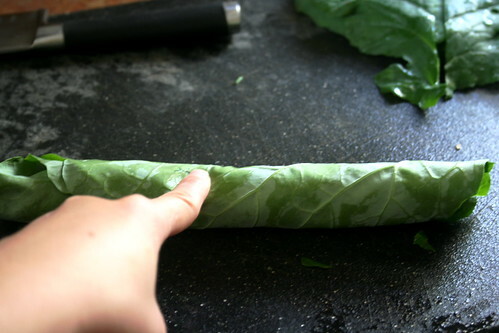 Then roll the leaves into a cigar shape. 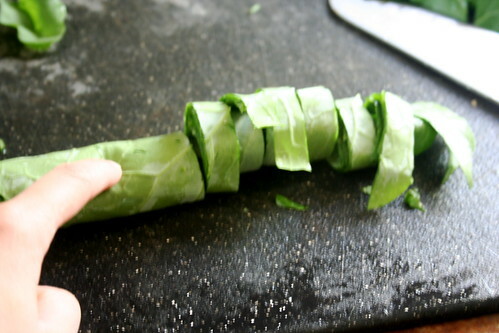 Slice the leaf roll into thin ribbons. Repeat until all leaves are sliced. 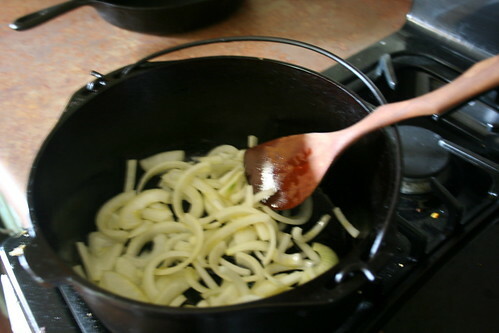 By now your onions should be a light brown, caramel color. If they are, add the greens to the pot. 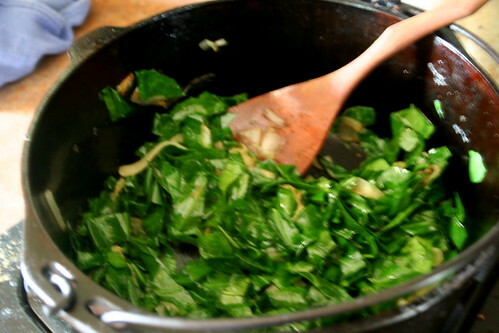 Stir in the greens to combine with the onions and the oil. Add the vegetable broth and nutritional yeast, cover, and let simmer for 20 minutes. 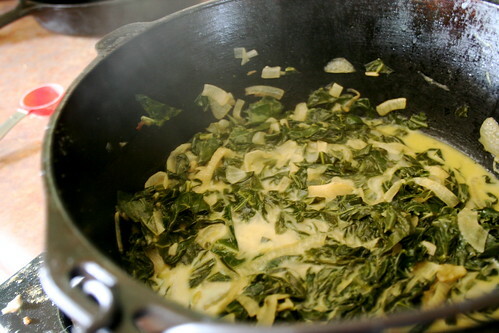 Remove the lid, stir the greens, and let simmer uncovered for another 10 minutes or until most of the liquid has cooked off. Check to see if they need more salt, add salt to taste, and then serve!